Some Tobin Marriages Co. Cork from Dr. Casey Collection from 1758. The Casey Collection includes marriages fro the records of the Church of Ireland Dioceses of Cork, most likely but not always Church of Ireland. In the Durrus area there were Church of Ireland Tobins in Fahane (Northside elevated overlooking Bantry Bay) a townland associated with the Johnsons. 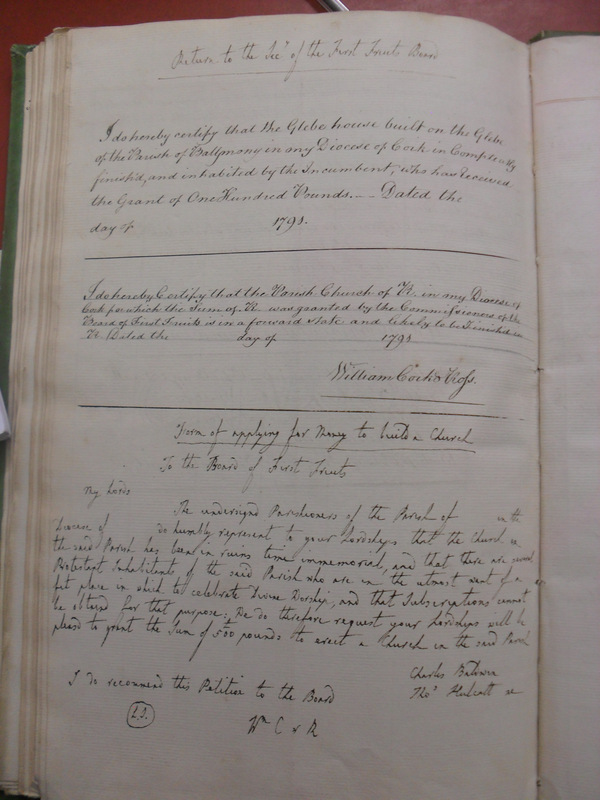 Form of application to build Church, to Church of Ireland Board of First Fruits 1790. From St. Finbarr’s Cork, Cathedral Records. Abbeystrewry (Skibbereen), West Cork, Church of Ireland Memoir, 1890-1990, The last ‘Caoin’ in Skibbereen, the Wren Boys, the day World War 1 ended, Tom Hosford’s school, Michael Collins on the day of his death, the first Airplane in West Cork, Protestant Businesses in Skibbereen 1890-.